Problem: I have a slight huge coffee addiction! Mix that with 3 sugar cubes and generous splash of heavy whipping cream per cup, and I've got myself a resolution breaker. Solution: Black coffee. No sugar. I've never been able to get through an entire cup in such a fashion, but today something changed. I had not one, but two cups of delicious black java juice! Granted, it was made with freshly ground Amaretto flavored beans from Smokey's in Big Bear- yum! To a slightly healthier new year! I drink my coffee black and my tea plain. I love flavored coffees though. One of my fave things is to put some sugar free cocoa in my java. hmmmmmmm. I really hope you'll check it out! thanks! haha. I love coffee. No sugar, just with a little milk. And, I used to drink so much each morning I can't believe I now actually switched to tea. What is wrong with me? haha. However, it's keeping me warm longer than coffee. :) hehe. Have a good day. Oh man I love coffee but I could never drink it black. FOr me the culprit is tea with two (plus 1) gulp..sugar cubes! The ONLY way I can drink coffee is black!! Welcome to the 'dark side' haha!! I can't drink black coffee but if it was made with flavored beans, I would probably try it out. Good luck to you!! I switched from sugar to Equal...but I just cant go to BLACK....let us know how it goes!! You'll get used to having it black very fast... as long as you're drinking good coffee! Hooray for finding a type you like. Coffee. My weakness. Good luck with the resolution. That sounds yummy. Though I'm a tea girl. 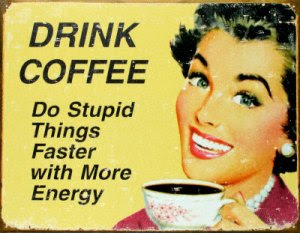 I stopped drinking coffee with anything, years and years ago. I do drink flavored coffee though but that is recent. My favorite is caramel cream, straight. I like putting cocoa in though. That would give it a great flavor. I have to try that. hi! really nice place. my stomach said 'no' for coffee, now im in love with green tee:) happy 2010! Yep, I love black coffee too. The only time I consider having milk in it is for iced coffee, and even then it's without sugar. There's *nothing* like an espresso with a twist of citrus after a good meal. If that doesn't solidify your need for simple black coffee, nothing will! I'll drink it black - my grandpa taught me a long time to learn to drink it black, because sugar and creamer might not always be around. I gave you something over at my blog.